Players in India, Turkey and Egypt are reportedly seeing improved demand as the construction industry in the Northern Hemisphere enters a traditional high season as per ChemOrbis. Prices in all three countries have posted some increases over the past week in accordance with the improvement in demand. Import PVC prices in India have posted significant increases over the past few weeks and players believe that the market may still have some room to move higher. 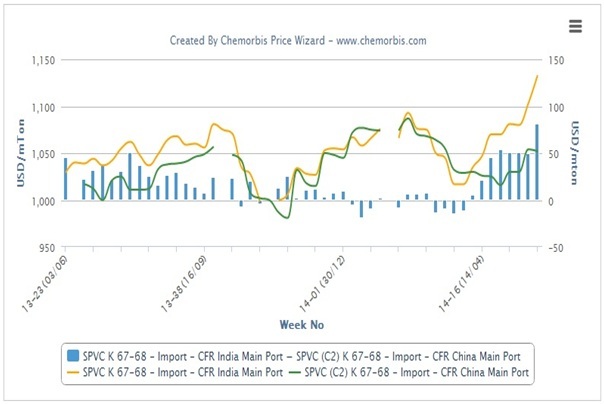 According to data from ChemOrbis Price Index, PVC prices on a CFR India basis are currently trading at a premium of around $81/ton relative to PVC prices on a CFR China basis, the highest premium India’s PVC market has carried over China for the past year. Several converters in the Turkish market made some fresh purchases this week, commenting that they are seeing some improvement in their end product business. “Our end product demand has picked up and we believe that demand will remain healthy in the coming weeks,” a profile manufacturer reported. Another profile manufacturer stated that they purchased a good amount of material over the past week as they are seeing good demand for their end products. A packaging converter who reported purchasing American and Northwest European PVC this week commented, “Demand for our end products has improved noticeably.” A trader based in Turkey also reported seeing better demand in the country, adding that they are hopeful that this up-tick in demand will persist into the coming weeks. 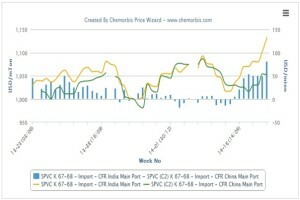 According to ChemOrbis, players in the Egyptian market also reported seeing some improvement in demand, especially for domestic materials. An Egyptian pipe manufacturer stated, “Demand is picking up in the country. Demand for domestic material is stronger than demand for imports these days owing to the stronger dollar and difficulties obtaining letters of credit from banks.” Another pipe manufacturer said that they are seeing better demand for their end products. “Now that demand is starting to improve, we feel that prices will witness some upward movement,” the buyer added. A trader offering American PVC to Egypt said that demand had improved compared with the past week, although they complained that demand remained below their expectations.